This fall, ABIM staff will again be attending a full roster of society meetings. We are excited to join an array of diplomates from across internal medicine and its subspecialties to continue to engage in direct conversations about ABIM’s Maintenance of Certification (MOC) program, including hearing about your experiences with the current MOC exam and your thoughts on the recently released Assessment 2020 Task Force report. I will give a presentation at the Alliance for Academic Internal Medicine (AAIM) Academic Internal Medicine Week, and I’m looking forward to meeting and hearing from diplomates in person. We look forward to engaging in thoughtful conversation with those of you attending these fall meetings. Please find us in the exhibition halls and share your ideas. Staff will also be available to provide information and answer questions about updates to the program. Additionally, we will be facilitating focus groups, informal coffee meet-ups, and one-on-one conversations with diplomates to hear feedback regarding the Assessment 2020 Task Force report. If you are attending one of the listed society meetings and would like to learn more about participating in a focus group or to schedule time to speak with us, email assessment2020@abim.org. 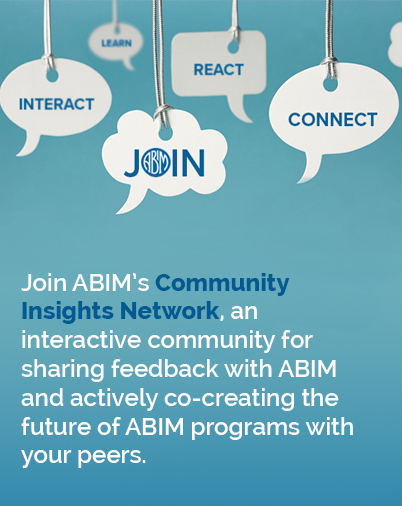 Subscribe to the Transforming ABIM blog for regular updates and to learn ways you can become involved, and please share your thoughts as we continue to collaborate with the internal medicine community to ensure that MOC is meaningful and relevant.